Smooth 9.35 HR has everything you'd expect from an "under $2000" treadmill and more. Smooth Fitness keeps coming up with new upgrades and features, making sure it's treadmills stay both reliable and technologically advanced while still cheaper than the competing models and Smooth 9.35 is a perfect example. 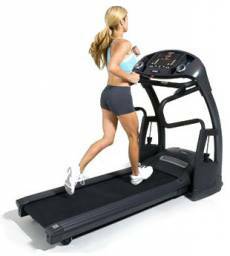 A sturdy treadmill with a strong 3.0 hp motor, roomy running area and a good amount of preset workout programs, Smooth 9.35 also features an innovation which additionally solidifies it's "best buy" status - Hydra Suspension adjustable shock absorption system offers 12 different cushioning levels, allowing you to choose your own preferred level of softness. With such a great list of features and a competitive price, this machine is a real winner. If you're a jogger/runner looking for a top quality, reliable treadmill for under $2000, Smooth 9.35 HR is your best bet. Hands-free speed adjustment - change the speed by waving your hand over the console. Choose among 12 different cushioning levels. 6 customizable workout programs and 9 storable user profiles for multiple user households. Chest belt transmitter helps adjust your workout according to your target heart rate setting. Triple-laminated deck with a phenolic resin and a 2-Ply Whisper Weave low friction belt. Do you have any experiences with Smooth 9.35 HR or any other treadmill ? Help your fellow exercisers by writing a short review about your machine.